Renominated chairman writes commentary warning Congress not to limit the central bank's independence. 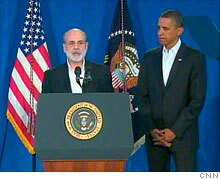 Fed Chairman Ben Bernanke, nominated for a second term by President Obama in August, faces a confirmation hearing Thursday. "These measures are very much out of step with the global consensus on the appropriate role of central banks, and they would seriously impair the prospects for economic and financial stability in the United States," Bernanke wrote. "The government's actions to avoid financial collapse last fall -- as distasteful and unfair as some undoubtedly were -- were unfortunately necessary to prevent a global economic catastrophe that could have rivaled the Great Depression in length and severity, with profound consequences for our economy and society," he wrote. But the Fed chairman says that, while reforms are needed, "we should be seeking to preserve, not degrade, the institution's ability to foster financial stability and to promote economic recovery without inflation." Among the ideas he supports is development of a special bankruptcy procedure for firms "whose disorderly failure would threaten the integrity of the financial system -- to ensure that ad hoc interventions of the type we were forced to use last fall never happen again." "Now more than ever, America needs a strong, nonpolitical and independent central bank with the tools to promote financial stability and to help steer our economy to recovery without inflation," Bernanke wrote.